This is gonna be long, so bear with me! it may seem over the past few months my contribution to the forum has reduced...that's because I've been having a bad problem with the car :-(....READ ON! IN december I had my wheels replaced due to corrosion of the alloys..very minimal but the dealer did it anyway and mounted my old tyres onto them. since then i've been having dreaded vibration problems at around 65-75mph....i thought..it's just the wear pattern on the tyres and the two front tyres almost needed replacing so i left it another 1000miles when i bought some new tyres to replace the fronts...vibration still there so i got them rebalanced hoping this was it....it didn't work! Fine i thought i'll swap the wheels around...vibration still there but slightly different!.....now i was getting annoyed. I finally resorted to booking it back into the dealer to check..again very helpful and they told me the tyres are out of balance. i thought fine...ENOUGH of this balancing, it been balanced twice before (three times including the original balance by the dealer when they replaced the alloys!). I had enough of balancing issues and located a Hunter GSP9700 road force machine - in derby! (I'm in leeds) got them to redo the balancing and checking for runout and apparently they were fine (OR SO I THOUGHT!!!! read later). I also had them check alignment on their 4 wheel alignment machine and they adjusted it. On my drive home..initially thought was ok but the vibes were still there although reduced somewhat, these were NOT steering feel from the road..they were vibrations which wobbled the wheel. I got to the stage, questioning myself whether the car was like this all along but i really couldn't believe it was like this......you know what it's like after a while you begin to question yourself!!! I thought i had ruled out balancing as a cause (SO I THOUGHT!) and was now thinking more about suspension, driveline, bushings and ball-joints....as you would have guessed at this stage i was quite depressed....i had babied the car and can't believe there is now this thing which is spoiling the experience!!!!!! It was back to the dealer again to look deeper into the driveline, steering an suspension. On the ramp I was called in and the dealer said that the alignment looks off and said the suspension bits are all tight.....But I just had it done! !...dealer was very good about this and didn't charge me for their time (Very good dealer Stratstone Honda Leeds). I made a radical decision........I'm gonna get some new alloys with some tyres!!!! since I wanted to change the alloys anyway. Well a week later I had my new alloys (make and model will be posted later :-)) and some yokohama tyres. I STILL GOT BLOODY VIBES!!!! but much more reduced I couldn't bloody believe it! I was about to really give up on the car..but i perservered, i knew it was a better car than this! I turned to the front brakes after much googling.....looked at my brake discs and yes they were at the limit...i changed them, doing a maticulous job of cleaning the hub before getting the new discs on and also checking for runout. New Discs and new pads later......still there!!!!!!!!!!!!!!!!!!!!!!!!!!!!!!!!!!!!!!!!!!! I didn't know what to do.....I really didn't! the car actually seemed to be getting worse! it felt like it was wandering and didn't feel as sharp as I once remembered.....but at this point i thought this was how the car always drove! Somehow I felt the alignment just didn't feel right, even though I'd just had it 4 wheel aligned with printout! Well i got there and thought since I'm here I asked them to see if the wheels were balanced. They checked it using a fine balance mode on the balancer and sure enough they were out of balance....but to be honest nothing surprised me anymore.......i resorted to thinking EVERY BLOODY SHOP IS GONNA GIVE ME A DIFFERENT BALaNCE! Anyway all 4 wheels balanced and up on the alignment ramp. The car was really far out of alignment!!!!!!!!!!!! Apparently the rear adjustment nuts were not tight...in fact they were loose!!! You see my car has Ingalls rear camber adjustment kit and the nuts where not tighten...as in they forgot!!! 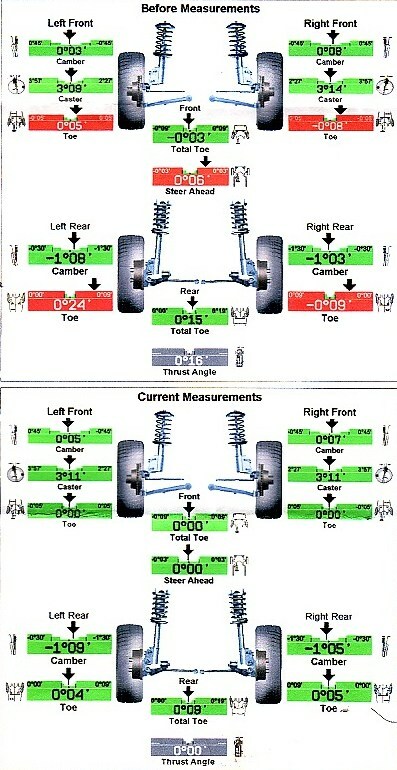 in a 4 wheel alignment, the rear tyres are aligned straight and the front wheels are then matched to the rears. I guess the rears had been slowly wiggling out of alignment giving me that strange feeeling. Anyway I MADE SURE that all the nuts were tightened properly this time!!!! I thanked them and left thinking..here i go again...i didn't expect anything....on pulling off yes the car felt much more connected to the road seemingly, but i was still in the middle of liverpool so couldn't tell. well I got onto the motorway, the car felt so much more like how i remembered it to be! but there was still a slight shimmy although it was very slight now......i drove home thinking well at least it's not wandering anymore and feels tight. drove 30 miles and i thought to myself, there is much less vibs, drove another 30miles and the vibes seemed to turn into road feel.......i couldn't believe it. I stopped at a service station to get gas, thinking that the vibes will just return when i get back to motorway speeds. Back on the motorway and no it was just road feel!!!!!!!! SO THIS IS HOW THE CAR FEELS I THOUGHT! I remembered why i loved the car sooooo much!! ================THE ANALYSIS====================So my car had finally been cured! what a case of baddddd luck to have the alignment and balance of the new alloys out!!!! I needed to find out what the hell caused all this! 3 months had now passed for me to find a fix! i took it on myself to look again at the original alloys replaced by the dealer. I spun them one at a time on one of the front hubs of the car and found 1 to have a lateral runout of 1.8mm!!!!!!! YOu could see it wobbling left to right when looking down on the fender! I couldn't believe this even after having them on the famed Hunter road force machine!!!!!! Why did the HUNTER GSP9700 balancer miss this? Here is what i think. to measure runout on the rim the operator attached two measuring arms to the inner and outer lips of the alloy..in effect i think the machine measures lateral and radial runout by measuring the difference between the two arms....yes it will detect a defect if there is a big dent in one side but in my case it was as if the alloy wheel was twisted at the hub section....so effectively the inner and outer edge of the alloy still measures as parallel!!!!!!!!!!!!!! THIS IS A HUGE FLAW IN THIS MACHINE!.....sure it balances fine but i think the runout measurement is not all too good!!! As you can see from my case! It took a guy who knew his car and perservered to find a problem that was missed by the most sophisticated machines and so called professionals! KNOW YOUR CAR! 3 months and I think there's not a single bit of the suspension or steering that I'm not intimate with. I think I have the most finely aligned/ riding Type-S in the whole of UK, here is the alignment specs, before and after alignment at liverpool, feel free to match it if you want to feel how the car should feel! THE CAR drives as well as you remember it..there is absolutely no vibration, but road feel, don't ever doubt it again!! it's a fantastically handing and riding car! - The feel of something that you thought you'd lost is priceless!!!! A machine is only as good as the operator using it! I see the alignment you've obtained here was with Ingalls rear camber kit, but was it with stock suspension or lowered suspension ? Something else, can you modify the caster ? I'm wondering how the car will feel with a bigger caster (on the green range of course). Edited by dinoc, 26 August 2010 - 11:52 AM. Alnug did you have your Ingalls (at the time you made this alignment) with your stock suspension or lowered suspension ? Alnug I have stock suspension but upgraded anti-roll bars front and rear + a strong front strutbar the car feels much better now , the body-roll is reduced and it handles betters. But I believe it needs a better alignement, so as I have an Ingalls kit sitting around unused from my previous CL7, do you think it will worth trying to have a negative camber on the rear (like -1 degree) each side, with my setup ? will it worth doing it with my setup ? Edited by dinoc, 29 August 2010 - 07:19 PM. Dinu, I can't recommend you anything unless you can give me your stock readings as they are now, adjussting rear camber has the effect of making the car turn more sharply in cornering, however you slightly affect stright line on centre stability...this is more noticeable when you have stiffer suspension. Your best bet really is to try different camber settings at the rear, as to how you like it,..but you should start with the stock settings and tune it from there...for what it's worth I'm at -0.5deg each at the rear. Think I need mine doing, car pulls to the left and a slight wobble has just appeared. Tyres are all new and balanced. How much are we looking at for the alignment? I have just bought Honda accord diesel and I am certain car is pushing to left. The bloke i brought the car off has recently changed the rear tyres but did not notice anything. I live in Coventry, can anyone recommend something,.. Shall I balance and track all 4 wheels. Pulling to one side is far more likely to be your tracking/alignment/geo (whatever you want to call it). Generally incorrect Camber or Toe on the front or rear suspension. Go to somewhere that does alignment and get them to check it out first. Got the tracking down as the mechanic said front right was a liitle off so could be reason why call pulling to left. Car seems lot better. Is getting the alingment done same as the tracking? On my 2001 accord the back wheels are slight in from the top and one of the tyres is wearing out. Have no idea whats causing this but it is stressing me out . Could you help? Edited by Alnug, 05 July 2011 - 04:26 PM. It all depends what you are at now...you need to get it to a centre that can give you a 4 wheel alignment printout as a starting point...also do you have modified suspension? lowered etc? CHEERS MATE. TAKING IT IN NEXT WEEK TO GET IT DONE STRAIGHT HOPEFULLY. BUT I NEED TO FIND OUT IS WHAT IS THE CENTRE READINGS, IF ANY ONE CAN HELP ITS A 2001 ATR. ALSO ITS ON THE STANDERD SUSPENSION. birdy - how did you find langs they are my local and may need to make a trip there soon? how much did they charge you?